Symbioses between plants and nitrogen-fixing bacteria can be ecologically advantageous for both parties. Surprisingly, many partnerships, including some involving the ancestors of several modern fruits such as strawberries, blackberries and apples, have been dissolved during evolution. Root nodules. Source: C. Cathebras, LMU. All plants require an adequate supply of inorganic nutrients, such as fixed nitrogen (usually in the form of ammonia or nitrate), for growth. A special group of flowering plants thus depend on close symbiotic relationships with nitrogen-fixing bacteria as a source of fixed nitrogen. The plant provides specialized root nodules as ‘housing’ for its bacterial benefactors, which allows them to make use of energy-rich organic carbon compounds in return for the ammonia they generate from atmospheric nitrogen. Thus, both partners reap advantages from the relationship. 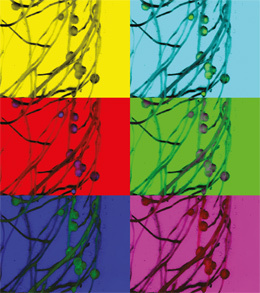 Nevertheless, a comparative study of 37 plant genomes carried out by Munich molecular biologists based at LMU and the Helmholtz Zentrum München (HMGU) in cooperation with French and Chinese colleagues, demonstrates that the capacity to form root-nodule partnerships has repeatedly been lost during the course of evolution. The new findings appear in the leading journal Science. The ability to form root nodules in response to the presence of nitrogen-fixing bacteria is currently restricted to four orders of flowering plants (Fabales, Fagales, Cucurbitales and Rosales), to which many agriculturally significant species – including beans, peas and soya – belong. The authors of the new study therefore assumed that the genetic basis for this type of symbiosis initially evolved in a common ancestor of these groups. “However, only 10 of the 28 plant families that make up these four orders are now able to form nitrogen-fixing root nodules. Moreover most of the genera in nine of these families do not adopt the symbiotic lifestyle,” says LMU geneticist Professor Martin Parniske, who initiated the international collaboration. In order to identify the genetic grounds for the relatively low incidence of root nodule symbioses among the plant families in which it occurs, the consortium collected DNA samples and the BGI in China sequenced the entire genome of 10 species that form distinct types of nodules with diverse bacterial symbionts, which in turn employ different infection strategies. In close cooperation with LMU and the HMGU, the genomic sequence data for these species were then included in a genome-wide comparison of 37 plant species representing the four orders mentioned above. Much to everyone’s surprise, the analyses revealed that many members of these groups – including well known cultivars such as strawberries, blackberries and apples – had once possessed, but subsequently lost the capacity to form symbioses. “We discovered that the gene NODULE INCEPTION (NIN), which is an essential prerequisite for root nodule symbiosis, has been repeatedly and independently disabled by mutation in several different lineages. The functional gene was therefore most probably present in a common ancestor of these lines, but was later lost several times independently,” explains first author Maximilian Griesmann, doctoral student at LMU who at HMGU worked closely with Manuel Spannagl, Georg Haberer and Klaus F.X. Mayer, head of the Department of Genomics and Systems Biology of Plant Genomes at HMGU, on the genetic analyses. “These findings were completely unexpected. In many terrestrial ecosystems, low nitrogen availability is a factor limiting plant growth, so that one would expect the symbiosis to be associated with a definite selective advantage,” adds Parniske,. According to the paper’s authors, one possible reason for the frequent breakdown of these symbioses is that root nodules can be invaded by parasitic bacteria which compete for, and consume the compounds provided by the plants without supplying nitrogen in return. In that case, loss of the symbiosis should effectively be favored as an evolutionary adaptation that enables the plant to escape this form of exploitation. Other scenarios in which the symbiosis no longer benefits the host are also conceivable, such as a persistent oversupply of nitrogen or situations in which the availability of other essential substances – like water or phosphates – constrains plant growth. In the field of synthetic biology, efforts to equip non-symbiotic crop plants with the ability to establish root-nodule symbioses are underway, with a view to reducing the need to supply fixed nitrogen by applying environmentally problematic fertilizers. “Our results suggest that evolution exerts a selective pressure against the maintenance of root-nodules symbioses, and future studies need to take this factor into account,” Mayer points out.